The bottles are available in PP, PC or PSU with metal dispensing cap. Can be fitted on to Rat, Mice, Guinea Pig and Rabbit Cages. In different capacities like 150ml, 250ml, 500ml. 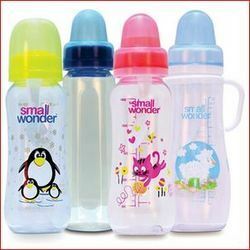 We are a well-known firm of Wide Neck Feeding Bottle that is enormously used in the market. 1.Feeding Bottle with pure silicone teats, is carefully made to highest safety standards. 2.Easy to clean and maintain. Note : The product comes in various attractive color, the one available will be shipped to you. Innovative Farlin Transbottle I Silicon bottle is made of 100% food grade silicon that has no open pores to harbour bacteria thereby ensuring baby gets the nutrition from the milk as pure as nature planned. We are the leading manufacturer of the Soft Cup Advanvce Feeder.